Jason Seidman hits a shot. The junior has a 6-6 record this season for the Cats. The last time Arvid Swan coached Northwestern, the Wildcats had yet to begin its Big Ten campaign and were coming off a heartbreaking 4-3 loss at Harvard. The coach’s return this week from a leave of absence, which he took March 8 to address a personal health issue, will provide a spark to an NU team heading into one of its toughest weekend road trips of the season. The Cats (9-12, 4-3 Big Ten), who went 5-4 during assistant Chris Klingemann’s interim head coaching tenure, will travel to face Penn State (13-9, 3-4) on Friday before squaring off against 2nd-ranked Ohio State (22-2, 7-0) on Sunday. Swan said he’s encouraged by the state of the team to which he returned. NU had won back-to-back Big Ten matches for the first time since last season, but saw its streak end with a decisive 4-0 loss against No. 11 Michigan last Sunday — although sophomores Dominik Starý and Chris Ephron were leading their individual matches at No. 1 and No. 6 singles, respectively, when the overall match ended. 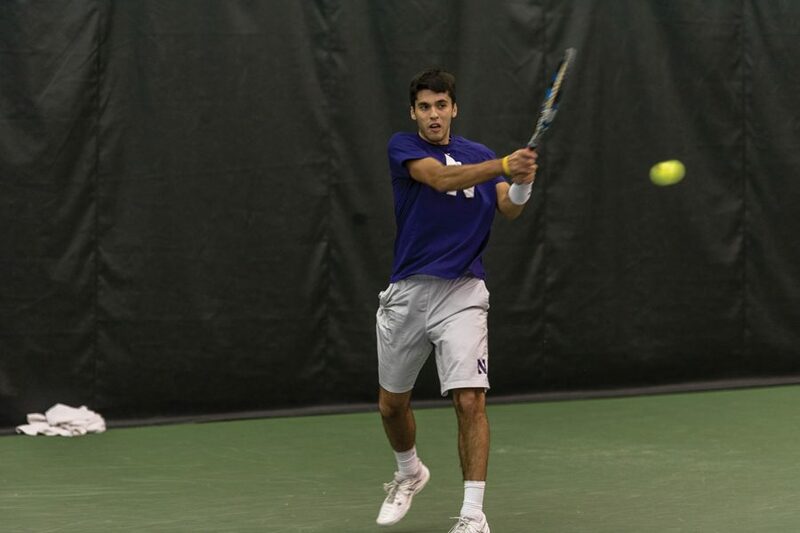 “Obviously the Michigan match was tough, we expected it to be tough, but (against) Penn State, we’re just looking to build on some of the performances we had,” said junior Jason Seidman, who plays No. 5 singles. Starý has an 8-6 record this season despite generally facing every opponent’s best player each match, but he’ll likely face a stiff pair of opponents this weekend: Penn State’s Christian Lakoseljac is 13-6 and Ohio State’s Mikael Torpegaard is 17-4 this year. And Starý won’t be the only Cats player facing a challenge this weekend. “It’s two good teams, but we’ve played really a lot of quality opponents throughout the year, so I think guys will be ready again,” Swan said. The Nittany Lions are below the Cats in the conference standings but are an unblemished 9-0 at home this season, most recently taking down Big Ten foes Nebraska and Iowa last weekend. The Buckeyes, meanwhile, have lost only twice this entire season, are 13-0 at home this season and boast five players ranked in the top 100 nationally: No. 4 Torpegaard, No. 40 JJ Wolf, No. 68 Kyle Seelig, No. 90 Martin Joyce and No. 98 John McNally.